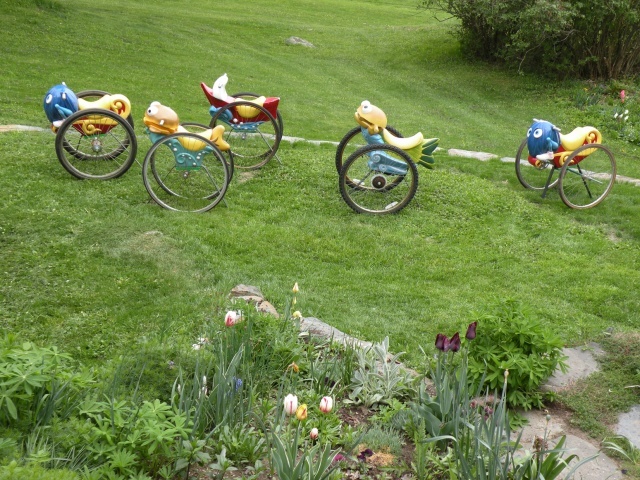 SculptCycle, a bicycle themed sculpture exhibit, enlivened Montpelier, Vermont from June through October 2008. This sculpture, made using highly collectible early MacDonalds Playland toys,, spent the summer in front of City Hall where it was much enjoyed by the public. It is now owned by The Lazy Pear Gallery at 154 Main Street, Montpelier, Vermont (802-223-7680). Contact them if you are interested in owning one or more of them.